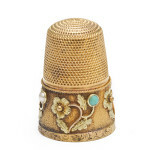 Antique thimbles are trinkets most often of precious materials, as beautiful as they are functional, imbued with both sentimental and intrinsic value. While they originated as sewing implements, over the centuries their decorative features evolved to complement their new functions as fashionable gifts, status symbols, and tokens of affection. In the preindustrial era, the significant amount of domestic sewing made thimbles and other sewing implements common household possessions. Over time, they became increasingly valuable. For example, by the sixteenth-century, silver thimbles were listed in wills and other legal documents. 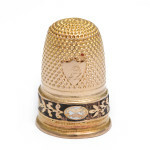 Gold Directoire period French thimble with black and white enamel border. 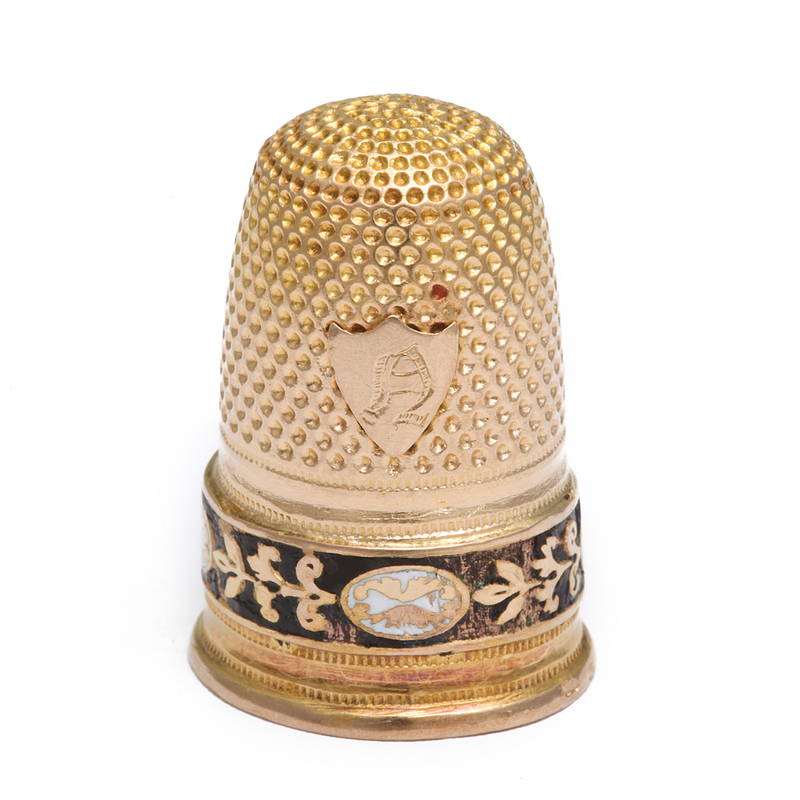 As thimbles became more valuable, they became more decorative. 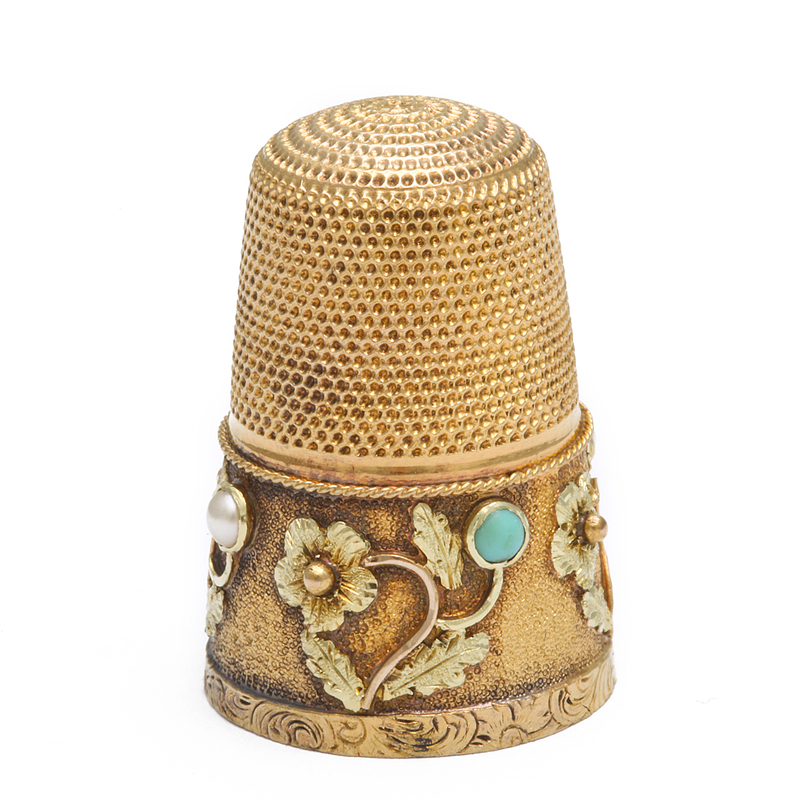 In the fourteenth-century, French goldsmiths began making decorative thimbles. By the sixteenth-century, thimble decoration became more distinctive, consisting of relief designs, foliate scrolls, and mottoes. The finest thimbles were mostly gold. Other materials varied by region. Glass thimbles came from Venice and Bohemia and wooden thimbles came from Germany and Austria. 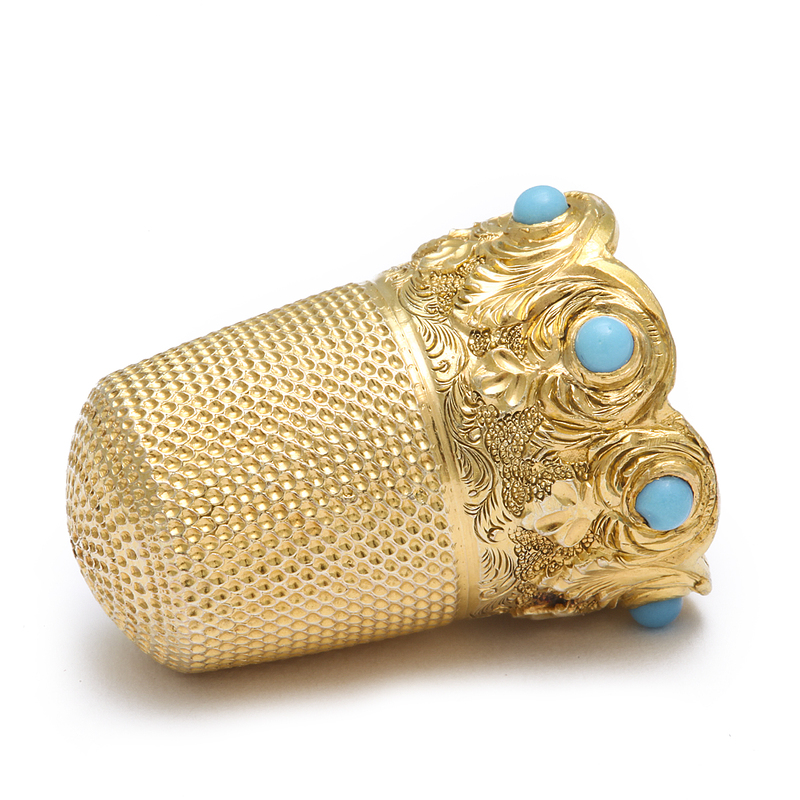 English 18k gold thimble with with turquoises, pearls, and gold scrolls set in an elegant floral pattern. Mid-nineteenth-century. The production of porcelain thimbles began in the eighteenth-century by a number of factories, but thimbles from the Meissen factory remain the most revered and sought after by collectors. Porcelain thimbles share common decorative motifs like flowers, birds, silhouettes, landscapes, fishing or hunting scenes, pastoral scenes, harlequinades, and chinoiseries. Rims are often scalloped or crenellated. Left: English Bilston Battersea thimble with multi-colored floral sprays on a white ground. 1765. Middle: Meissen porcelain thimble with early pruncing and a wide border of flowers. Mid-eighteenth-century. Right: Meissen porcelain thimble with chinoiserie decoration. 1735-40. Gem-set thimbles featured an array of gemstones like moonstone, amethyst, jade, topaz, sardonyx, coral, onyx, turquoise, carnelian, and moss agate. Some were thought to have apotropaic qualities specifically for protecting eyesite, a fair concern for a seamstress. Moss agates protected the eyes, as well as sardonyx, which offered the added bonus of defending witchcraft. Turquoise thwarted eye disease and poison. 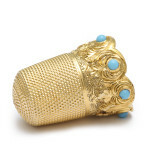 English 18k gold thimble set with seven turquoises within a floral scroll decorated border with scalloped edge. Ca. 1840. Today, thimbles still make excellent gifts and are avidly collected. Also, if one happens to be in search of a protective amulet, by all means, consider a thimble.